When you buy a new sport quad, there’s a fairly common order of aftermarket parts that you buy for it. More aggressive tires, a performance exhaust and handlebars are all common bolt-ons. However, one of the most common failures a new sport quad suffers is a bent or broken axle. The amount of aftermarket axle companies making axles is rather small compared to other components people buy for their ATV. Tusk, the in house brand of Rocky Mountain ATV/MC, offers one of the most affordable axles at $199. Don’t consider this axle to be cheap by any means. We have had great luck with the Tusk-brand axles over the years. It’s made of hardened chromoly steel with chrome plating. All stock axles have a dull steel finish. The Tusk axles have a lifetime warranty against bending or breaking. Even if you are racing your quad, the warranty still applies. Amazing! The Tusk axle for the YFZ450 doesn’t come with a sprocket or brake rotor hub, but it does come with a new lock nut and hub nuts. Each Tusk axle is adjustable from stock width up to 2 or 4 inches wider, depending on spacer placement behind the wheel hubs. It does weigh about 3 pounds more than stock at 17 pounds, but that’s not much if you consider its extra length and, not to mention, strength! We installed this particular axle on an older YFZ450. For comparison, a stock replacement axle from the Yamaha dealer would have cost over $350. So opting for a new unit through RockyMountainATVMC.com was an easy choice. It slipped right into the stock bearing carrier and clamped right into place. Our stock hubs all slid on easily and matched right up. The retaining nut has a secondary pinch bolt, so you have no worry of the nut backing off like some axle nuts do. You can use regular “large” hand tools to tighten the retaining nut to their recommended 25 foot-pounds, or purchase a $13 axle wrench directly from Tusk. For this machine, the stock nut takes a 40mm wrench and the Tusk nut takes a 70mm tool. The complete install takes about 30 minutes. Rocky Mountain ATV/MC has complete step- by-step directions on their website. After several weekend rides, the Tusk axle is holding up as expected. It rolls smooth and has taken a beating and stayed straight. Even the chrome finish has held up perfectly. 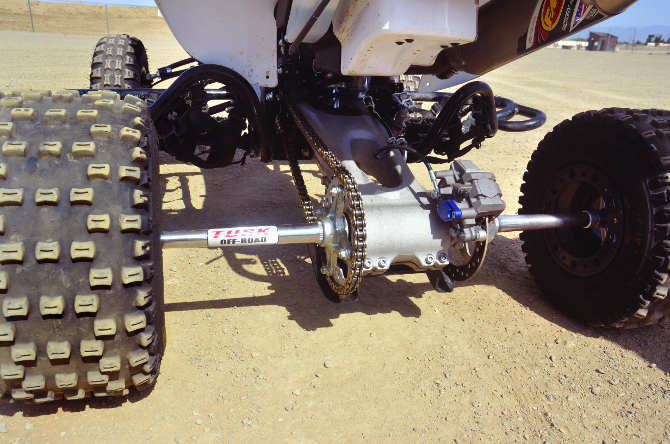 There are more expensive axle choices out there, but from our experience, the Tusk axle has never let us down, so it’s hard to recommend anything else. Buy any Tusk product by calling (800) 336-5437 or at www.rockymountain atvmc.com.